Mt Everest - Himalayan secrets that the Tibetan Mother Nature jealously keeps away from the “intruders’ eyes”….. I cannot describe you our sigh of relief when first from far and then from closer and closer the Mother of all Mountains exposed her beautifully majestic silhouette over the clear sky. From the Mt. Everest Base Camp the special bus took us to the observation point – a little hill richly decorated with Tibetan prayer flags and rock piles with an open view on the Chomolongma. Thin air suddenly was not a problem, excitement took over! We quickly (given the fact of being at 5500m above the sea level) climbed the hill and then I had to pinch myself to believe my eyes….. .
View on the mountain with Prayer Flags. The rock piles and prayer flags are the most visible symbols of the Tibetan Buddhism. 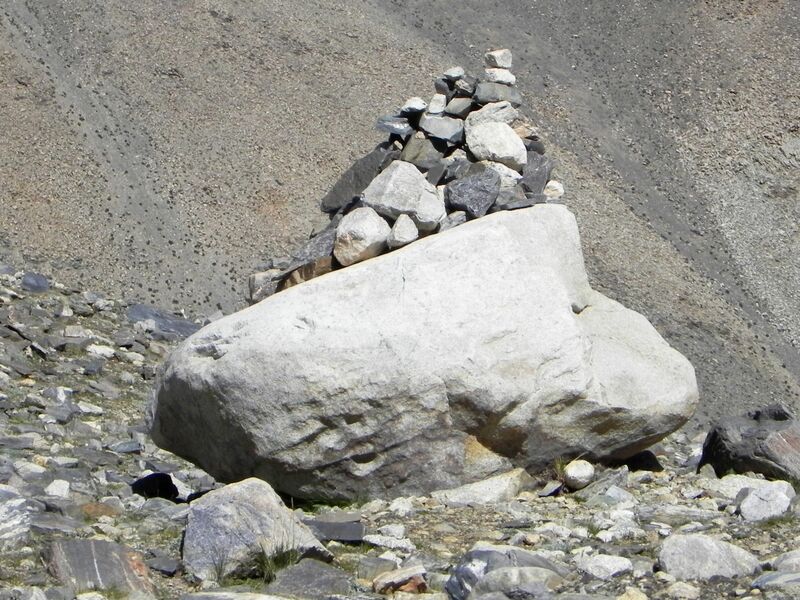 Rock piles have origins in Mongolia, serving as religious sites and places of worship. This practice was adopted by Tibetans to pay homage to the spirits of mountains to ensure a safe journey – certainly a great concern for people living in the wilderness of the Roof of the World. Raising rock piles certainly requires not only a physical effort but also a prayer and meditation….. . Although most of them are erected from regular stones easily available in the area, some may contain rocks with inscriptions of Buddhist mantras. Prayer Flags so visible in every corner of Tibet serve the similar purpose. In believes of local people they personify a human quest for happiness and peace. The wind endlessly carries written on them prayers and spreads the Buddhist blessings. Quomolangma's North Face seen from the base camp . Now, once I had time for reflections I have to admit that Mt. Everest seen from the North Base Camp was quite different from what I was expecting. In my naïve beliefs from the stories I read about Himalayas, I imagined a gigantic mountain range created by the tectonic collision of gargantuan proportions, I imagined numerous summits piercing the sky. Well, may be it was just what I wanted to believe in? Because the reality was quite different – confirming the well known truth that our perceptions of reality are strongly affected by the “point of observation”. As a "bonus" - visit to Everest Base Camp during a journey through Tibet. Scenes of Everest, hike to Everest Base Camp and flight past Everest by Thomas and Donna.